Here’s a little helping hand holding these awesome things that start with p cards out to you. Please take them home and make them your own. 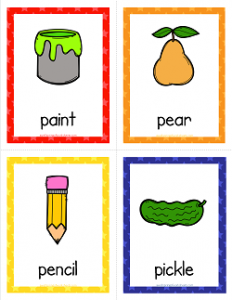 They have the words paint, pear, pencil, pickle, pig, pizza, pumpkin, & puzzle on them. Perfect for preparing your kids for puckering up and sounding out the letter p. Practice makes perfect we know so be sure and give your kids plenty of practice with p words like these! 12 cards, 3 pages with 4 cards per page. Go to this page to see all the things that start with a to z cards in this set.